Second Ferment: But can you get it at the LCBO? But can you get it at the LCBO? Last week I was at the California Wine Fair's afternoon trade event (read: party), brushing elbows with chefs and sommeliers, club owners and bartenders, and "the media", which includes everything from the local paper to wine blogs (lucky me!) I even got cut in line by Natalie Maclean (those big-shot wine writers ... sheesh). There have been numerous articles written on how to tackle this sort of thing. Go for the tables that have the most people around them - that's where the expensive wines are. (But who says they're good?) Start with whites, move to reds. Weight should go from light to heavy. Or try all one varietal. Or all reds. Or only whites. Yeah, I pretty much pitched that plan at the door. I grabbed myself a glass of Gloria Ferrer 2005 Blanc de Blancs (always a good place to start) while I perused the floor plan, trying to match two-dimensional locations with a name and an actual table. Then off I went. A couple of laps around the room yielded some truly amazing finds, with Birichino at the top of the list. Run by a couple of young lads from Bonny Doon (John Locke and Alex Krause, the latter manning the booth that day) this side project is all about getting wine drinkers to try something new. I started with the 2010 Vin Gris, made from cinsault, grenache and vermentino, the vines of which are 125 years old! Phenomenal colour: pale orange-pink in the glass; nose of fragrant perfume, with an airy feel on the palate. It had only been in the bottle for three weeks, but was holding up well. I'd like to see how it tastes after a bit of a rest. Next in line was the 2009 Malvasia Blanca, which was twice as ambrosial: melon, honey, lily of the valley, with a citrus taste and a tart finish. I inquired about Birichino's availability at the liquor store; nope, not happening. But it would certainly be worth considering for a private order. Anyone wanna split a case with me? Hahn Family Wines 2009 Pinot Noir (Monterey) - California pinots, having basked in the sun longer than their northern, cold-climate counterparts, are a thing of exquisite beauty. This one was all warm raspberry, with a solid seam of acidity and just a touch of pepper. Available in August. Fleur de California 2008 Pinot Noir (Central Coast) - I tried the '05 at Fourth Avenue Wine Bar a couple of years ago; this one was equally elegant, with a plush mouthfeel and moderate, well-balanced acids and tannins that kinduv creep up on you. Match it with lamb or a hunk of salmon. Available May 13. Fleur de California 2010 Pinot Noir Rosé (North Coast) - If pink had a taste, it would taste like this. Light, breezy strawberry, a true summer sipper for the patio. Available in July. 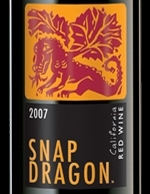 Snap Dragon 2007 Red Blend - The shnazzy label caught my eye; the wine's food-friendly, easygoing feel really grabbed my attention. Plenty of fruit up front, firm structure and a peppercorn finish, this zinfandel/cabernet/merlot blend would be great for the BBQ. Available in June. Cupcake 2009 Chardonnay (Central Coast) - First heard about this one from Dooce. It's an unoaked wonder full of lush tropical fruit and a smooth, buttery texture. Have it alongside seafood or a creamy pasta dish. Available July 16. Peju 2006 Province Cabernet Sauvignon - Save up your shekels for this one: $64.95, and yes, it's at Vintages right now. Glorious example of California cabs. Sharp, complex nose a bit heavy on the alcohol, but with a supple mouthfeel, balanced composition and a smoky, dried-fruit finish. Now that you've done Disney World, maybe you'll just have to go to California. Been there, done that! Only Napa/Sonoma thus far, though. Time to go back.